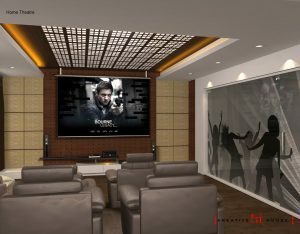 A dedicated media room with high-tech audio and visual components is among the most desired amenities for Luxury homes. It creates a great place to watch television or movies and enjoy the program with minimal distractions. Since home theaters are specially designed to maximize the viewing experience, they allow you to enjoy all the benefits of an actual movie theater without leaving your home. Similarly, lights with dimmers can be very beneficial as well. This type of lighting system can help ensure that the lights are not too bright as to cause a glare on the screen, but also light enough that no one will trip when moving about the room. Dimmers are a great tool for controlling the ambiance of the theater experience. And consider cove lighting at the top of the walls and wall sconces. Providing “layers” of dimmable lighting will give you total control of the “feel” of the room. 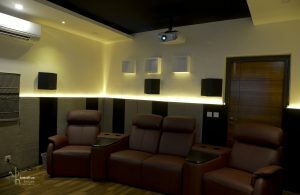 The most important aspect of getting your home theater right is correct sound equipment placement. Surround sound speakers should be used, complete with a sub-woofer to really punch out the bass. Many home theater designers also find it beneficial to place padded fabric on the walls to help control reverberation (echoes) in the room. The walls, floor and ceiling should be sound-insulated to allow you to crank up the volume without disturbing others in the house. Products like fiberglass sound insulation, mass-loaded vinyl sheets behind the drywall, and extra-dense drywall, like Quiet Rock will help keep those dramatic theater sounds inside the room and not let them echo throughout the house. The position of the seating area proportional to the viewing screen is critical to creating a perfect home theater experience. No one should be so far away from the screen where they feel they have to squint to see the screen and also that no one sits so close that they have to keep moving their heads to see the entire screen. Typically, the larger the screen the further back the seating should be. If the space in the home theater is limited, a smaller screen size will be better than a larger screen. A uniquely furnished villa in Hyderabad!! Elegant and Luxury Walk-In Closet Ideas ! !